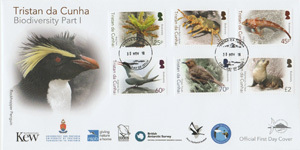 Stamps illustrating Tristan's biodiversity - Part I with Bog Fern, Tristan Rock Lobster (Crayfish), Klipfish (Black Devil), Antarctic Tern (Kingbird), Tristan Thrush (Starchy), and Subantarctic Fur Seal. 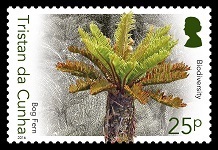 The Bog Fern is a large, distinctive, cycad-like fern, with stems up to 1.6m tall and 30cm in diameter, sometimes with short side branches. It occurs on all the islands, including Gough, from sea level up to about 800m on Tristan. They are particularly attractive in spring, when the new golden fronds emerge. 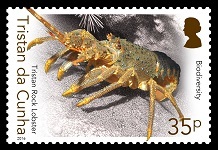 Of the few species of large crustaceans that occur at the Tristan islands the rock lobster is extremely abundant. They occur from intertidal pools to more than 200m deep. 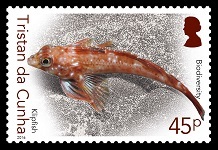 Endemic to the Tristan islands, Gough and Vema Seamount, they support an important fishery that is the mainstay of Tristan's economy. Klipfish are unscaled, bull-headed fish that reach a maximum length of 25cm. They occur in rock-pools and shallow sub-tidal areas. Most are olive or blackish-green above, but can vary from reddish-brown to blackish to match their habitat. They are endemic to the Tristan island group and Gough. 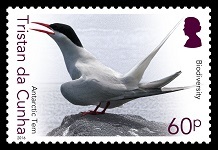 The Antarctic tern is known locally as the kingbird because despite its diminutive stature it fiercely defends its nest and chicks against all other birds. It breeds throughout the Antarctic, reaching its northern limits at Tristan, where it is represented by an endemic subspecies. 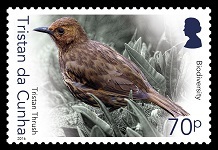 The starchy or Tristan thrush is confined to the three northern islands, and is the only landbird that survived colonisation by people on the main island of Tristan. It eats a wide range of prey, from berries and insects to eggs and chicks. They even hunt and kill adult storm petrels. Hunted to the brink of extinction in the 19th century, sub-Antarctic fur seals found refuge on the rugged, wave-swept boulder beaches along Gough Island's western coast. 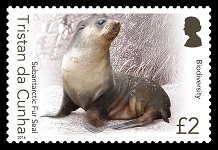 Since sealing ceased, they have recovered throughout much of their former range, but Gough with some 300,000 animals remains the world stronghold for the species.